Fig. 6.1-3. Transverse section through a woody stem of pine (Pinus). The gray material at the top of the micrograph is the secondary phloem (part of the bark) and the red material at the bottom is secondary xylem (wood). The several layers of thin, flat gray cells between the two constitute the cambial zone, the region that contains the vascular cambium. 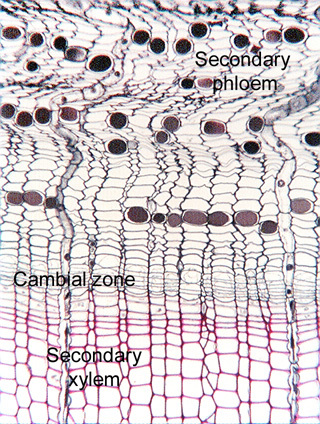 The vascular cambium produces both the secondary phloem and secondary xylem; that is, it is located between the two tissues that it produces. Although it is not a common verb, we could say the vascular cambium is intercalated between the tissues it produces, it is an intercalary meristem. At the same time, if you consider just the xylem, the vascular cambium is located along its side, so the cambium could be called a lateral meristem. Usually, however, the term "lateral meristem" is used for the margin of a growing leaf blade.